Hello stamping friends! This week at the Paper Players, our fabulous hostess Ann has a theme challenge for us: CAS (clean and simple) Masculine cards. 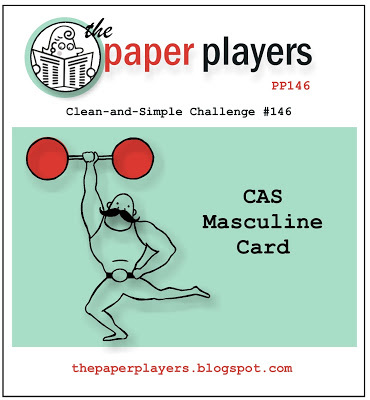 I always need ideas for fun "guy cards" so I can't wait to see all of the ideas shared for this challenge. I wanted to make a golf-themed card for a friend's birthday and this is what I came up with. It was simple and easy to put together and sometimes that is a good thing, right? Also, it is easy to mail and that is always a bonus. The only stamping on the card is the sentiment from the Banner Greetings set. I can't tell you how much I love that cloud embossing folder. It really added to the scene which (hopefully) resembles a golf course "green". I even busted out some old school decorative edge scissors for the grass. Whoa! Please join us this week over at the Paper Players! The challenge is open through Friday, May 24th at NOON (PDT). Please check out what the rest of the Design Team have created with this week's clean and simple challenge. Before I go, I wanted to share a photo of our new foster kitty. We are taking care of him for a local rescue and I just picked him up yesterday afternoon. His name is Triple and is a very special guy. He is a little shy at first but once he warms up, he does great. He is about 7 months old and came to the shelter needing to have one of his front legs amputated. He's still adjusting in his private room here and hasn't met the rest of the crew yet. This is a great manly card, Anne Marie! I love the hand-made green and the grass. Very cute and creative! WONDERFUL CAS card, Anne Marie! Just love that you busted out those old deco scissors!! They were fun to use. Love your little kitty too....makes me want to get another, he is so similar to Pumpkin's coloring! Bless you for doing all you do for animal rescue! Your card is adorable! And I don't know what to say about you and all of those critters you help - amazing! You have a wonderful heart! Love it Anne! Ahhh Triple is so cute! I hope he loves the crew when he meets them. Anne Marie... what a great CAS card. Love the "hole in one" theme too. so cute how the flag stamps make a PERFECT Golf flag. Love that! So sad about the amputation on the little kittie too. I'm sure your furry family make a welcoming announcement soon. hugs. Perfect manly card!! Love the golf theme. Breaks my heart that Triple had to have an amputation. 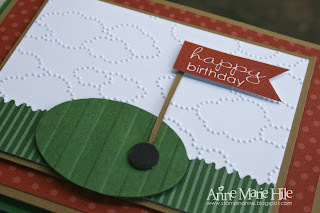 Wonderful golf themed card Anne Marie! It's amazing that with a few simple snips you can turn your background into a golf course. And I love the little flag, perfect! You are such a kind soul to take in a kitty needing so much love. Bless you, and little Triple. I hope he learns to adjust and finds a loving home. 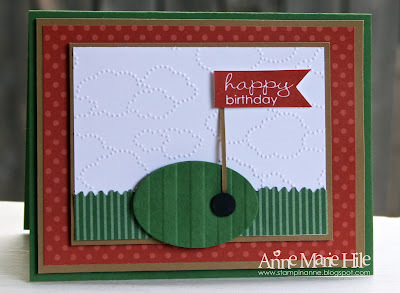 Cool golf card....I really like all your layers and colors. Yah! Welcome Triple!!!!!!!!!! You're doing a great job Anne Marie!!! Love this golf card! Those embossed clouds are great!! !